I spent the middle of August in Queensland. Respite from Melbourne’s very chilly winter was a bonus but not the purpose. 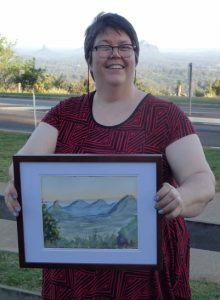 Instead, I was attending my first ever Romance Writers of Australia conference, and then loitering a little longer so I could join Tim on the Sunshine Coast for his conference with the Australian Society of Travel Writers. And then I got to cuddle a snake. 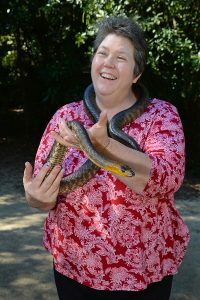 The RWA conference – Love Gone Wild – was a big financial commitment, but it was definitely worth the time and the money to attend. Apart from getting to meet with hundreds of fellow writers of romance, I was able to attend the conference sessions. I learned something new at every single panel, even ones where I felt fairly sure I knew the material being covered. I was able to hear from established writers, publishers and agents about how the industry is changing, how people are responding to the changes, the opportunities that are out there and how writers can look for new ways to engage readers. The conference was what finally made me work out how to import my blog, which used to live on a separate site, into my main website here! I’ve learned a lot about marketing and more than a few things about how to approach submissions and agent queries. I even won a raffle prize where I get to consult with a swordsman about writing fight scenes! 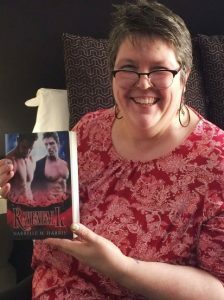 My new novel, Ravenfall, made its first appearance at Love Gone Wild – and it was the first time I got to lay hands on the trade paperback of this little beauty! 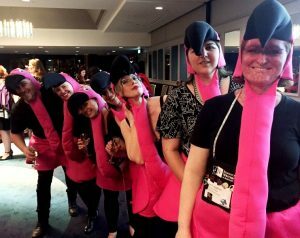 The fancy dress evening was a delight too – a flock of flamingos were there! 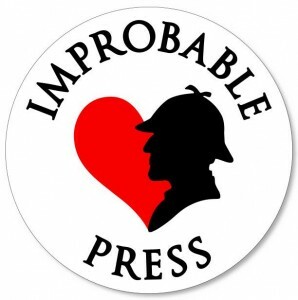 In all, if you’re a budding or established romance writer, I can highly recommend both membership of the RWA and attendance at their annual August conference. Not only are the sessions of enormous value, there are opportunities to pitch books to a range of publishers and agents. It’s being held at the Sofitel Wentworth in Sydney next year, so you can start preparing now! I’m not myself a travel writer but in my other life as a freelance writer, I’ve written for universities, hotel chains and entertainers. With Tim attending a conference only the weekend following Love Gone Wild, it made sense to hang about (and spend some time with my fabulous brother Stephen, who lives in Brisbane) and join Tim for some of the events that partners were invited to. 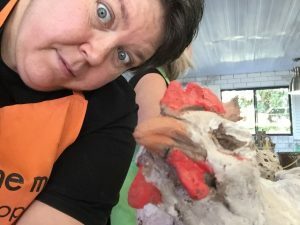 So it was that I found myself learning to paint watercolours in the Sunshine Coast hinterland with artist James McKay and later making pottery chickens at Fried Mudd. 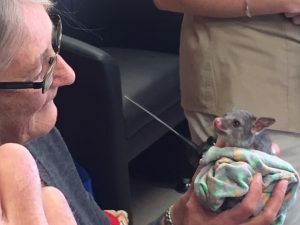 Not to mention seeing critters being cared for at the wildlife rescue centre and cuddling snakes at the Australia Zoo. This place is huge and witnessing two blokes feed a crocodile while attempting not to be eaten by one gives me even greater respect for crocodiles. My favourite part of the croc show was actually the birds – watching the bright parrots and macaws, the beautiful whistling kite and the massive Andean condor. I was fortunate later to meet a macaw up close. It’s important just as a person to be curious about the world and to seek out new experiences. As a writer, your curiosity is one of your best writing tools – to go forth and try things out. You never know if you’ll need to write about them. More to the point, I often write about things soon after experiencing them. Now. How soon can I get a character to muck about with a snake? In late March, the first Queermance writers festival was held in Melbourne, celebrating queer relationships in fiction. Attendance was relatively small but very keen. Overall, Queermance 2014 was both fun and educational, and a terrific opportunity to meet other writers and publishers of LGBT fiction. I’m hoping to soon have some guest posts by Scarlett, and host of the Getting Published panel, Nicolas Frank. One exciting outcome of the festival was the Queermance Anthology. I have a story in it, Late Bloomer, about a rather melancholy judge named Harcourt and his relationship with his gardener, Jake. I did a reading from that story on the Friday night at the launch of the festival/anthology. The e-book also contains stories by Mary Borsellino, Kerry Greenwood, Matthew Lang and Kristen Henry. Huge thanks and congratulations to the Queermance crew, especially Matthew Lang who kept things moving and kept the attendees more or less in line. When he’s recovered, I hope he takes up the challenge of doing this again next year! Read the anthology? Why not leave a review here, or on Amazon and post the link!